When working with fire in a commercial kitchen, there are a few things you must be aware of if you care about fire prevention. Kitchen fires are one of the most common causes of devastating losses to commercial businesses in the United States. Commercial kitchens are full of many the ingredients needed to make a huge fire, so it isn’t too surprising that they are such a big cause of commercial fires. 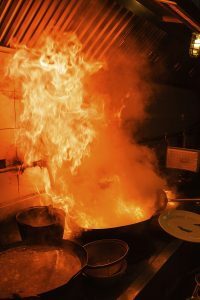 Fire prevention can be somewhat difficult if you’re unsure of what you’re doing.Taking proper safety precautions is important to ensure that a fire in your commercial kitchen doesn’t damage your restaurant forever. Dirty and damaged equipment can lead to fires in your commercial kitchen. Keep your kitchen equipment clean every day, especially things like ovens, stovetops, and deep fryers. Make a maintenance checklist so that you have regular maintenance performed on all of these appliances. A little bit of time invested in protection and prevention can stop a commercial fire from ever occurring. Sprinkler systems are your best line of defense against a commercial kitchen fire and are necessary for any fire prevention plan. Over time, the heads, pipes, and other system elements become corroded and damaged. If you do not have regular maintenance performed on your sprinkler system, it will be out of order when you need it the most. Schedule regular maintenance on your sprinkler system so that it works when you need it the most. Judd Fire offers many different maintenance packages to meet the need of every type of commercial kitchen. Grease is common in every commercial kitchen, but controlling it is the most important thing you can do to prevent a bad commercial fire. Have cleaning protocols in place that your employees must follow every day before starting work and at the end of a service. Since grease is so highly flammable, it should not be allowed to build up on any surface. If your employees are unable to clean away grease to the degree it needs to be, hire a commercial cleaning service to get the job done. This entry was posted on Friday, August 11th, 2017 at 10:02 am. Both comments and pings are currently closed.